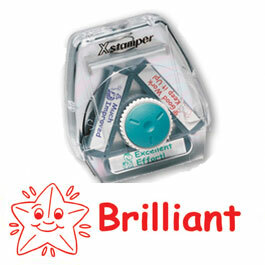 The wide range of teacher stampers we stock quote they will last for thousands of impressions or 'prints' but what you need to know is that this is dependant on how they are used and stored. The impressive figure of 1'000s of stamps per unit is calculated by the manufacturers using a machine (thankfully not a teacher!) and is in fact not the maximum number of stamps but the average. However what you need to be aware of is that the number of impressions achieved depends entirely on how the stamper is used. 1.How hard the stamper is pressed. Pressing hard on a stamper uses the ink up quickly and produces a smudged image which will remain wet for a while and therefore is liable for spreading further. All our stampers only require a light stamping action to get the clearest image, plus of course it ensures they will last longer. 2. The absorpency of the paper used. Using the stamper on certain types of paper such as a jotter or form of recycled paper will also use up more ink as these papers tend to be more absorbent. Think of it as the same as using a felt tip pen on jotter paper, the ink will spread out more than when it's used on normal flat white paper e.g. photocopy paper. Lower 'grades' of paper that tend to have a higher level of absorption can result in the above mentioned bleed of the ink into the paper, resulting in a slightly smudged stamper impression. To get around this problem, if you need to use this type of paper, try using less pressure to help reduce the amount of ink being dispensed. 3. The type of paper used. While gloss paper or card is non-absorbent, using this type of paper should be avoided as the ink will either not dry (especially on high level gloss papers) or will take several hours to become touch dry. 4. How the stamp is stored. Stampers should be stored at room temperature (or allowed to reach temperature before use.). Using a teacher stamp that has been stored below room temperature will cause condensation on the stamp surface however, this will quickly disappear as it comes up to temperature. Don't panic if you find a slight amount of condensation on the stamp surface - this is quite normal and won't affect the stamp's quality or life expectancy. Lastly please note that the ink used in self-inking teacher stampers is not solvent based and therefore stamping on skin is not recommended. We hope you find this guide to getting the most out of your self-inking stamper useful. If you have any experiences to contribute that would be of interest to other teachers or stamper users, please let us know. 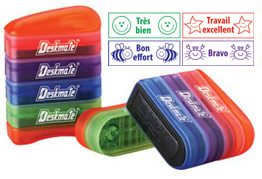 Click here to see our full range of stampers available.